Same colour as mine. I got caught with the Yama-lies that the proper MT wasn't coming to Aus and bought the Lams one. It isn't quite so LAMS any more. Nearly sold it , but found the hidden restriction removed it, and now very happy with it. Some good stuff on this forum about the soggy suspension fix. Also about the wrong fork bushes fitted. Have fun. This could be one of the great Yammies. Thanks, I'm pretty sure I've read all your good info, thanks for sharing...esp the airbox restriction! 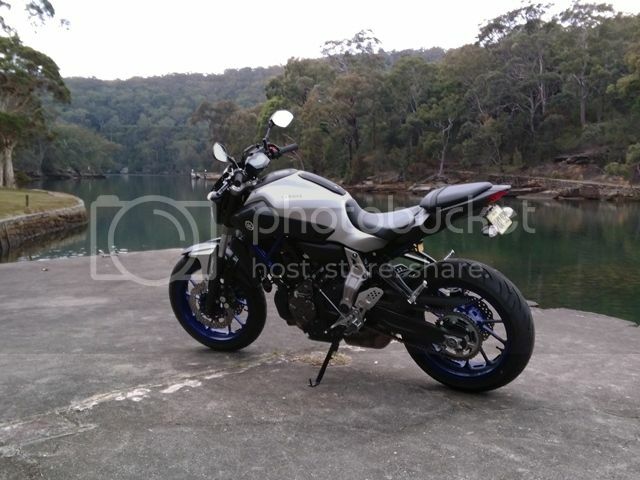 FWIW early on I asked YamOz if the MT07 was coming to Aus after reading the great reviews in UK's "BIKE". They said no. Asked a couple of months later and they said no...but the the LAMS was actually in the dealerships! (and I had a demo ride). I asked if they would do the full power version and was told "never in parallel with the LAMS". I'm glad the LAMS bike has done so well but sheesh...I know that in the month before the "HO" turned up one dealer in Sydney sold 3 LAMS bikes to fully licensed riders and they were a bit spewing. Welcome and nice bike! Is that a salty I see in there? Same colour as mine. I got caught with the Yama-lies that the proper MT wasn't coming to Aus and bought the Lams one. It isn't quite so LAMS any more. Nearly sold it , but found the hidden restriction removed it, and now very happy with it. Some good stuff on this forum about the soggy suspension fix. Also about the wrong fork bushes fitted. That's wierd. But then I tried posting pictures of a gold mine yesterday on facebook and they post upside down and on their side? ? Welcome to this very resourceful forum Dav, looks like you had enjoyed a blast in the RNP this double demerit point long weekend; heavy police presence and loads of slow weekend cagers I bet. HO colour scheme looks the business, it really stands out from a sea of grey and white LAMS. We don't even get salties down this far south ( Bundaberg). Sydney is way too bloody cold. I moved down from Townsville and still can't get rid of the apprehension when I go fishing in the mangroves here. On the same note , since we moved down here, Sally and I go down to the beach and run into the water and jump up and down every October. Then get back out and yell " It's October and no stingers!!!!!" That's Chironex Fleckeri and Irikanji to the uninitiated. NOW I live in Paradise. We don't even get salties down this far south ( Bundaberg). Sydney is way too bloody cold. I moved down from Townsville and still can't get rid of the apprehension when I go fishing in the mangroves here. On the same note , since we moved down here, Sally and I go down to the beach and run into the water and jump up and down every October. Then get back out and yell " It's October and no stingers!!!!!" That's Chironex Fleckeri and Irikanji to the uninitiated. NOW I live in Paradise.